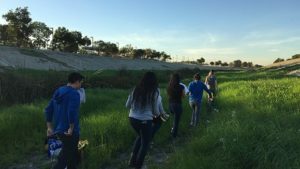 UCLA and LA Waterkeeper were selected by EPA under the Urban Waters Small Grants Program to work with Jefferson High School in south Los Angeles to conduct a neighborhood-scale assessment of industrial sources of pollutants to Compton Creek. Working first with a team of UCLA students, we developed and implemented a teaching curriculum for the high school students to provide the scientific and regulatory background that will allow them to conduct basic research on industrial pollutant sources. This included hydrology and chemistry components, as well as an introduction to industrial stormwater permitting. Training also included field work to gain on-the-ground understanding of urban drainage systems, conditions in Compton Creek, and industrial sources. Our team used multiple data sources including: field surveys; aerial photography; information from the State and Regional Board websites; and stormwater runoff monitoring conducted by Waterkeeper.